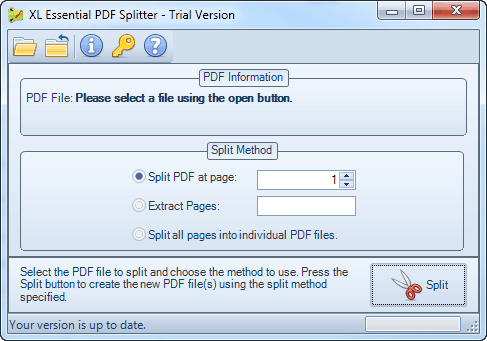 XL Essential PDF Splitter - Split PDF files with ease. 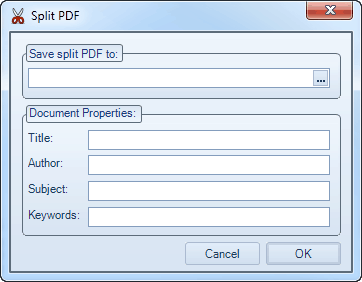 Quickly split a PDF file in 3 simple steps. Why use XL Essential PDF Splitter? With XL Essential PDF Splitter you can easily split PDF files. You can split each page into separate PDF files, split a PDF file at a certain page, or extract pages you specify into a separate file. Split all pages into separate PDF files. Split a PDF file in half or at a certain page. Extract pages you specify into a separate PDF file. Works with password protected PDF files. Set PDF document properties such as title, author, and subject.